Fuchs North America has established a reputation for pinpointing emerging consumer taste trends early … and coming up with fresh and original seasonings and flavors for snack makers, manufacturers of prepared food items, chain foodservice establishments and others in the food industry. What better way to showcase these new flavor sensations than by sending actual product samples directly to the product developers and food technologists who are responsible for introducing new products to consumers who are always eager to try the “next new thing” in eating and dining. 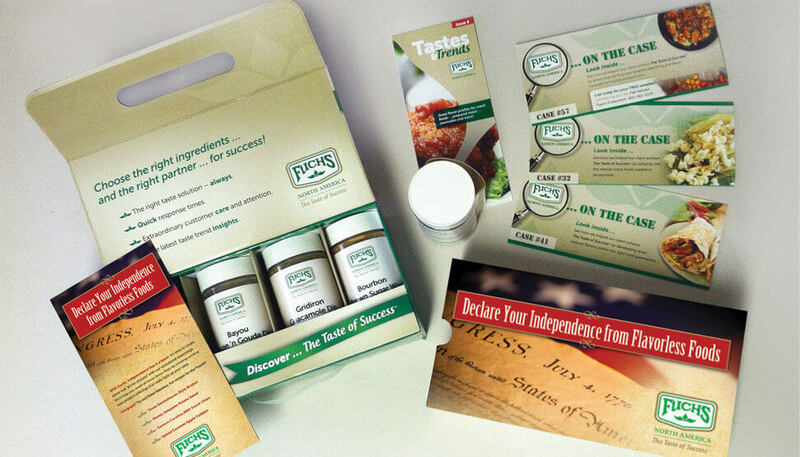 Talk about a direct marketing item that really gets attention every time it hits the customer’s desk! And it sets the scene for some very fruitful follow-up contacts by Fuchs’ field sales force, too. The marketing initiative also incorporates a direct marketing component to generate interest and requests for the sample packages before they’re shipped.